Shathabdhi is one of the largest diversified real estate companies with decade-long experience in Real Estate Sector, with the best team of real estate development professionals, Shathabdhi has been sincerely living up to the expectations of the buyers. With having completed six projects in Shamshabad and Kothur areas. Shathabdhi Township has grown to No’1 position dealing with only government approved plots like HMDA, DTC with Commitment, Quality & Timely execution has been the hole mark of Shathabdhi and due to which today grown up with 500 marketing professionals. Company: Shathabdhi Townships Pvt. Ltd. Address: 2nd Floor, 203 & 204,Vamshiram's Jyothi Prime Adjacent to GVK 1 Mall, Road No.1,, Banjara Hills, Hyderabad, Telangana, India. PropertyWala.com » Hyderabad Real Estate » Hyderabad Builders / Developers » Shathabdhi Townships Pvt. Ltd. 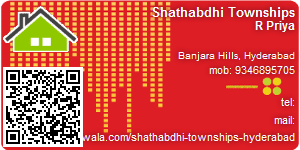 This Builder Profile page for "Shathabdhi Townships Pvt. Ltd." has been created by PropertyWala.com. "Shathabdhi Townships Pvt. Ltd." is not endorsed by or affiliated with PropertyWala.com. For questions regarding Builder Profiles on PropertyWala.com please contact us.